On Display is a series of glowing enclosures that reference window-shopping displays. By interacting with these sculptures the visitor is highlighted within the illuminated frame and becomes the object of interest in the ‘window display’. 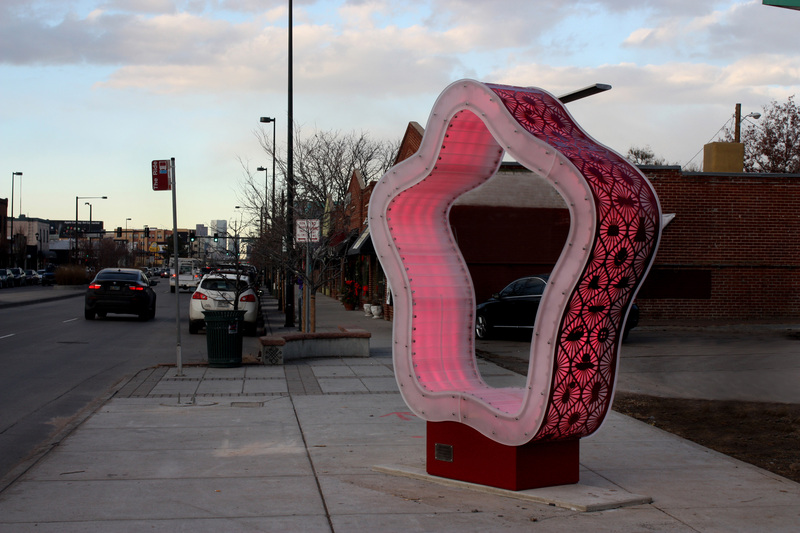 We are celebrating the South Broadway business district by putting the public ‘on display’. These highly interactive sculptures will encourage social collaboration and self-expression as each display is a unique shape and opportunity to engage visitors. On Display is meant to be enjoyed both day and night. Each display is made up of acrylic, with color added either by a powder-coated stainless steel wrap or a layer of colored acrylic. During the day sunlight streams through the acrylic walls creating a diffused glow of color and shadow patterns, adding visual interest to the streetscape. The stainless steel designs are text and imagery that relates to local interests and chosen by the community. In the evening, touch activated sensors trigger localized light patterns creating powerful sources of color for the surrounding area.